Several months ago whilst staying at The Balmoral Hotel in Edinburgh, I had the good fortune to meet Michael Portillo, whom many of our discerning readers will know, that after leaving the House of Commons in 2005 and subsequently retiring from politics, is now lauded as the flamboyant presenter of the acclaimed BBC documentary series Great British Railway Journeys. He was not there by chance, for this iconic hotel, overlooking Edinburgh’s famous Waverley Station, features with considerable prominence in Bradshaw’s Guide, the series of railway timetables and travel guide books Portillo followed as he travelled around the railway networks of Britain, Ireland and the Isle of Man in his now-familiar trademark exotic coloured-jackets. As we chatted eruditely over a bottle or two of the house Claret, Michael reminded me that the Balmoral Hotel’s clocktower is one of Edinburgh’s most striking landmarks and legend has it that, ever since it was erected in 1902, the clock is set three minutes early to make sure their guests never miss the night train to London. A veritable institution, the hotel was also the embarkation point for travellers joining the now-legendary Flying Scotsman, with its connections to the great continental railways of Europe, which Portillo explained, inspired him to present his much-lauded 2012 documentary series in which he describes how the various destinations have changed since Victorian times, when George Bradshaw penned his first travel guide book. If asked what makes a great railway journey, some will say the distance, some the countryside, some the scenery, while others will delight in the majestic locomotive that pulls the train, while for others it is the like-minded people they meet on the way. All these factors and more have a part to play in the journeys I have described below, which range from the legendary Venice Simplon-Orient-Express to the Palace on Wheels. Since Hannibal crossed the Alps, Europe has been inspiring travellers to seek out the glories of its civilisation, from the ruins of ancient Rome to the soaring, artistic triumphs of the Renaissance and the modern age. What more evocative way to see these treasures than on the Venice Simplon-Orient-Express? 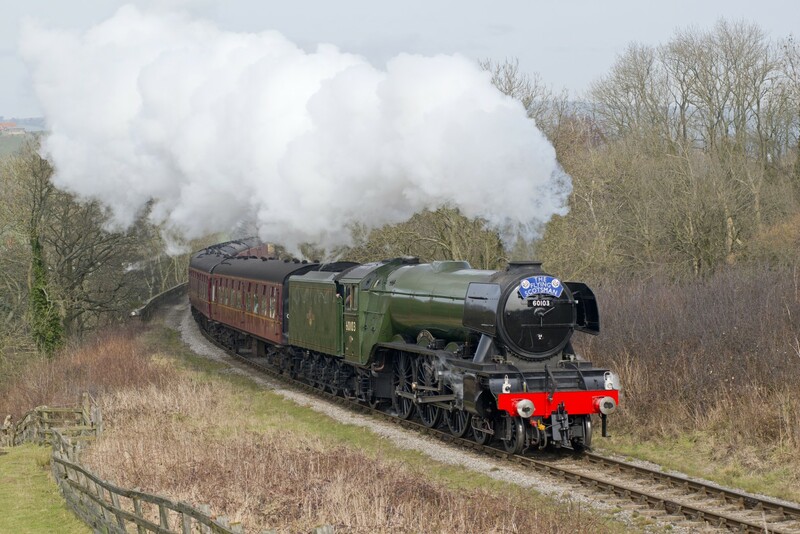 This legendary service has always been more than a mere train journey. Ever since the first trip from Paris to Istanbul in 1883, it has captured the imagination of the world. Thanks largely to the association with Agatha Christie, there has always been an aura of glamour, a hint of mystery about this train and the Queen of Crime’s Murder on the Orient Express has done much to increase the cachet of this mystery. The Second World War brought a savage interruption to rail travel across Europe and the original Orient-Express service fell into a gradual decline. That was until 1977, when James Sherwood, President of the Sea Containers group, attended a Sotheby’s auction in Monte Carlo where he acquired two sleeper carriages from the original train and thus, the process of resurrecting the great train had begun. Five years later, on 25 May 1982 Sherwood realised his dream as the Venice Simplon-Orient-Express departed from Platform 2 at Victoria Station bound for Venice. 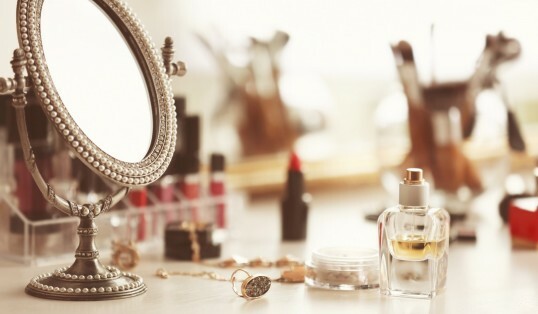 Today, the glamour and the romance live on. The train is composed of the original 1920s and 1930s British Pullman and Continental Wagons-Lits carriages, lovingly restored, boasting exquisite marquetry panels and designs by artists of the art-deco movement, including René Lalique. Elegant cabins are equipped with upper and lower berths and washing facilities. For added comfort, cabin suites, made up of two interconnecting double cabins, are recommended. The service is perfectly in keeping with the setting. Once your journey starts, you settle into your private cabin and watch Europe’s finest scenery glide by. 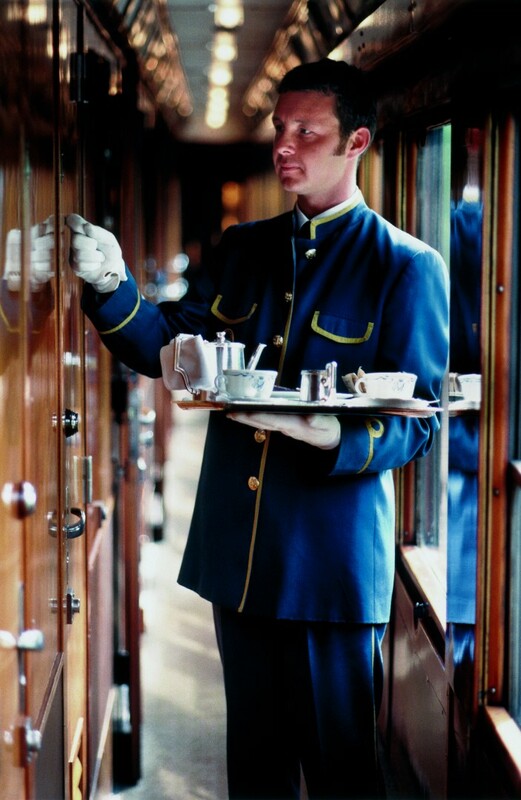 Liveried stewards minister to your every need, and will serve you breakfast and afternoon tea in your cabin. No request is too much trouble. As darkness falls, a gentle, sociable buzz begins in the bar car, accompanied by live piano music. There are three restaurant cars, each offering the finest cuisine prepared on board by French chefs, while an extensive cellar offers a superb choice of notable French and New World wines to accompany your meal. And, of course, the setting is different from that of conventional restaurants. The décor in the dining cars is, perhaps, the train’s finest and the attention to detail is breathtaking: the linen, the silverware and the crystal glassware are all part of the experience, where the service alone is an elaborate ceremony of almost forgotten rituals. When you return to your cabin, you will find it has been transformed into a cosy bedroom, with crisp, damask cotton sheets. Let the gentle rhythm of the train lull you to sleep. You will wake to a new landscape, fresh croissants, and a unique sense of well-being. Some experiences really do live up to expectations and the Venice Simplon-Orient-Express is no exception. The Glacier Express rail journey in Switzerland is equally famous the world over – not for its speed or glamour – but for the breathtaking views revealed as you spiral over the Alps. Known as the ‘slowest fast train in the world’, to travel on the Glacier Express from St Moritz to Zermatt is an experience to behold – a 7½ hour journey across 291 bridges, through 91 tunnels and across the 2,044m Oberalp Pass. Most people start this journey at St Moritz or Zermatt, but you can also travel on the train from Piz Bernina to the imposing Matterhorn. 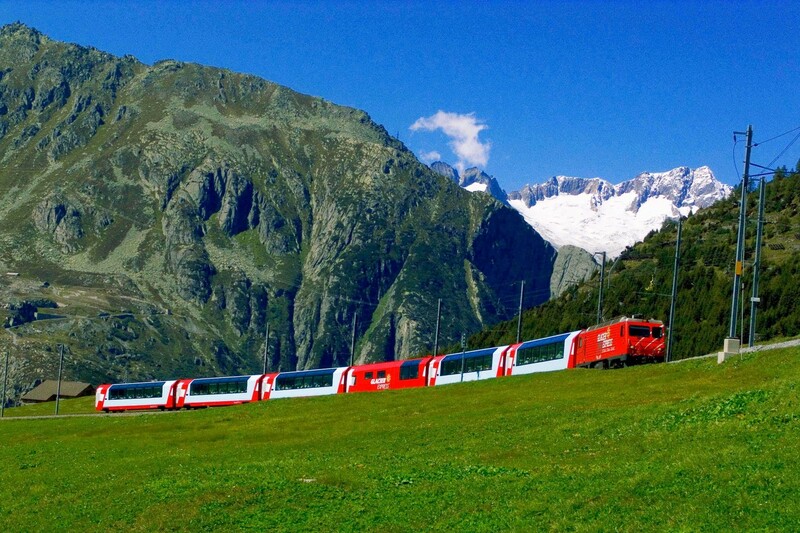 The Glacier Express travels a beautiful route between the sights of the Graubünden holiday region, the Valais region with its spectacular glacier landscape, and the unspoilt region of the South before dropping down to the Alpine meadows below. 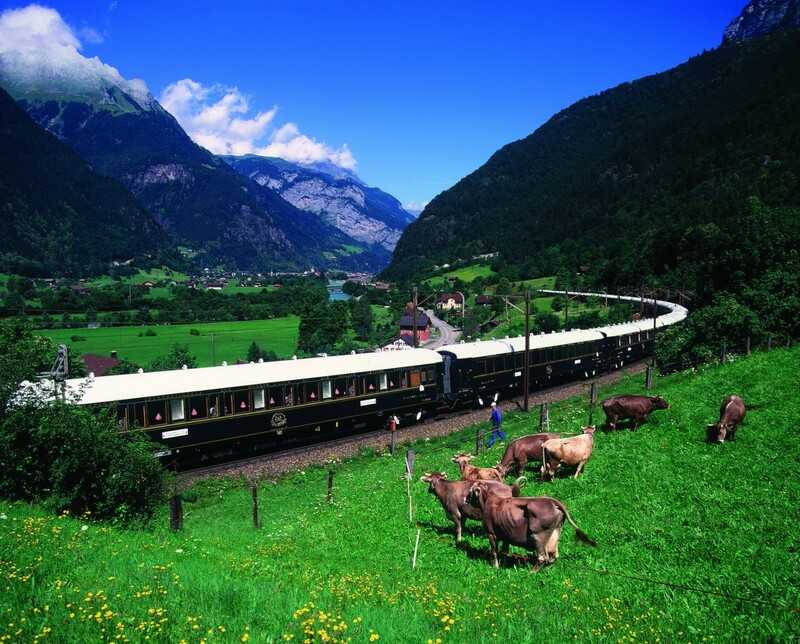 On board, meals are prepared for you by a Swiss chef in the dining car, while fresh coffee, drinks and a variety of snacks are served throughout the journey by the train’s railbar staff. Outside, meanwhile, is the unspoilt beauty of an Alpine landscape so beautiful it defies belief. A rich combination of natural wonders and cultural heritage makes Peru an exceptionally alluring destination for travellers with a sense of adventure. On the morning of 24th July 1911, an intrepid explorer named Hiram Bingham climbed up a steep hill and stumbled onto Machu Picchu. This secret citadel of the Incas, perched on a mountain peak, remains South America’s most spectacular archaeological site. Modelled on the elegant Pullman cars of the 1920s, PeruRail’s luxury Belmond Hiram Bingham train service between Cuzco and Machu Picchu is named after the American explorer who rediscovered the lost city of the Incas. The service was launched in 2003, and in great style follows those historic steps. Crossing the Andes meant constructing the highest railway in the world. Because of its altitude, the famous Peruvian Central Railway presented civil engineers with major problems, for, in a confined space and short distances, they had to build railways over passes that exceeded Mont Blanc in altitude. The solutions they adopted were tight curves, zigzags and rack sections. Operating the lines was also fraught with difficulties: steep gradients, lack of sources of fuel, heavy wear and tear on locomotives and rolling stock, and frequent landslides and washouts. Even the change from steam to diesel was, initially, a step backwards, because diesel units were prone to power loss in the rare atmosphere, and there were cases of trains being unable to take the gradients. Nevertheless, the line finally opened in 1908, and the service today follows much the same route as those intrepid pioneers who first laid down its tracks. The three lines of the Southern Railway of Peru serve the immense ‘altiplano’, a windswept plain 3,901 m (12,798 ft) above sea level. Of standard gauge, they run to Mollendo on the Peruvian coast through the country’s second city, Arequipa, to the town of Juliaca on the altiplano. Here the line divides. A short section continues to Lake Titicaca and around its shores to the port of Puno, while a 339 km (211 mile) line from Juliaca runs north to Cuzco, the ancient Inca capital, crossing a summit of 4,314 m (14,153 ft) at La Raya. 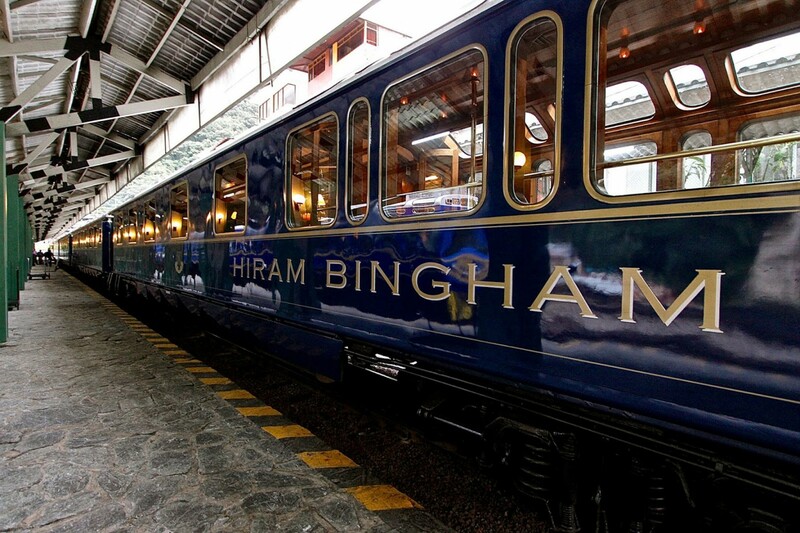 Using carriages purchased in Singapore and refurbished in Peru, the Belmond Hiram Bingham daily addition to PeruRail’s existing fleet of Vistadome, backpacker and local services on the Cuzco-Machu Picchu route, is one of the most spectacular railway journeys in the world. The train departs from Cuzco at 9am which gives a more leisurely start to the day than the traditional 6am departures of other services. Brunch is served on board whilst travellers enjoy the breathtaking scenery of the High Andes unfolding before them from the large windows, and the arrival in Machu Picchu at 12.30pm gives Hiram Bingham passengers the advantage of entering the Sanctuary at an hour when the majority of the visitors are already beginning to leave for their journey back to Cuzco to arrive in time for dinner. Thus, Belmond Hiram Bingham passengers will not only enjoy the opportunity to experience the ruins at Machu Picchu in relative solitude, but will have a longer period of time there, returning to the train only as the sun sets on the lip of the horizon. Once back on board for a 6 o’clock departure, pre-dinner cocktails are served in the bar accompanied by live entertainment, and afterwards a 3-course, a la carte dinner is presented in the dining cars. The train pulls into Poroy Station in Cuzco at 9.25pm with passengers relaxed and ready for bed. 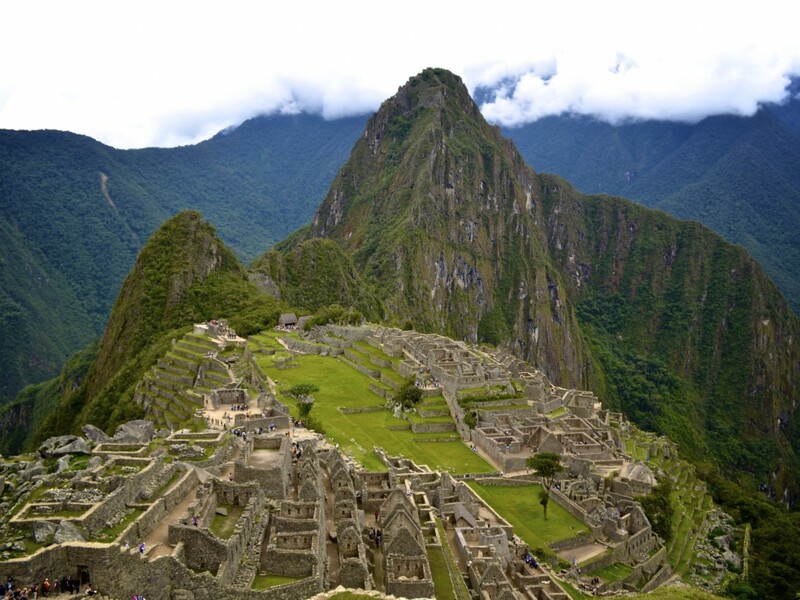 For many visitors to Peru, the journey to Machu Picchu is a once-in-a-lifetime experience. 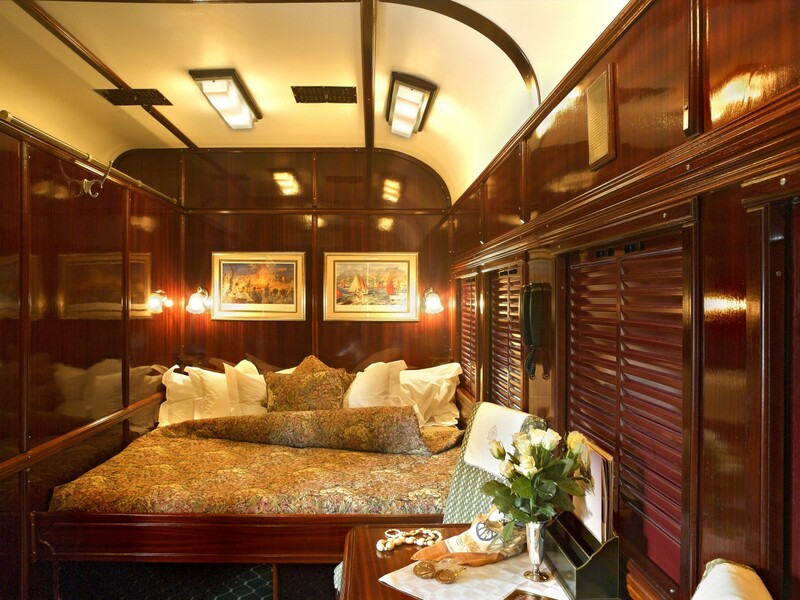 But the same can be said for travellers to South Africa where you will find Rovos Rail’s now legendary Pride of Africa – said by many to be the most luxurious train in the world. There is no finer way to see South Africa than on the popular 48-hour weekly journeys between Pretoria and Cape Town. This 1600 km journey is a perfect illustration of South Africa as a world in one country. Travel the grasslands of the gold rich Highveld to the haunting desert of the Great Karoo. Trundle through the spectacular mountain ranges and scenic wine lands of the Cape. Journey’s end is Cape Town, the Mother City of South Africa, cradled by the imposing backdrop of Table Mountain, Devil’s Peak and Lion’s Head. Since its establishment in 1989 by Rohan Vos, South Africa’s Rovos Rail has earned an international reputation for a truly world-class travel experience. Step aboard the wood-panelled coaches – classics remodelled and refurbished to pristine condition – and enjoy the finest cuisine in five-star luxury as some of the most varied scenery imaginable unfolds before you. Recapture the romance and atmosphere of a bygone era, when privileged travellers experienced the magic and mystery of Africa in a relaxed and elegant fashion. The trains, which may be hauled by steam, diesel or electric locomotives at various stages of the journey, carry a maximum of 72 passengers in 36 superbly appointed suites, offering every convenience and comfort. The epitome of luxury, with handsome wood panelling and period Edwardian features. Pride of place in the Rovos stable goes to the historic and recently refurbished Capital Park Station in Pretoria, the headquarters of the company and the place where each journey begins. Intriguing, delightful, beautiful and mysterious... all this can be said of Russia, a vast land stretching from the shores of the Baltic to the Sea of Japan, and to within sight of Alaska. Long cloaked in mystery, Russia is only now revealing its magnificent treasures to the outside world. From the monumental buildings of Moscow to the magnificent Ural Mountains, and from the endless steppes to the crystal clear waters of Lake Baikal, this extraordinary country never ceases to amaze. Steeped in history and with an incredible legacy of art, music and literature, this is the land of Catherine the Great; of Tchaikovsky, Tolstoy and the Communist revolution. Today, Russia wears its history with pride, as shown by a recent resurgence of interest in the pre-Soviet past. Across this great country The Trans-Siberian Railway runs like a steel ribbon connecting east and west. Opened in stages between 1891 and 1916, this extraordinary engineering achievement is a vital national asset, and by far the best way to experience the grandeur of Russia’s rarely visited interior. On 26 April 2007, HRH Prince Michael of Kent unveiled the ‘Golden Eagle’ Trans-Siberian Express, the new train that brings unprecedented luxury to one of the world’s greatest railway journeys. The 12 new, fully en-suite sleeping cars feature state-of-the art amenities. Gold Class cabins have everything from power showers and under-floor heating to a DVD/CD player, LCD screen and individual air conditioning – and at seven square metres, they are among the largest rail cabins anywhere in the world. A particular delight of the Golden Eagle are the two beautifully appointed restaurant cars, where delicious meals are carefully prepared using only the finest local ingredients. Whether it is the world-renowned ‘Borsch’, Oscietre caviar or Omul – a fish unique to Lake Baikal – you will be offered a fine culinary experience representing the very best of Russia. It is no surprise that Winston Churchill once described Russia as “a riddle wrapped in a mystery inside an enigma”. 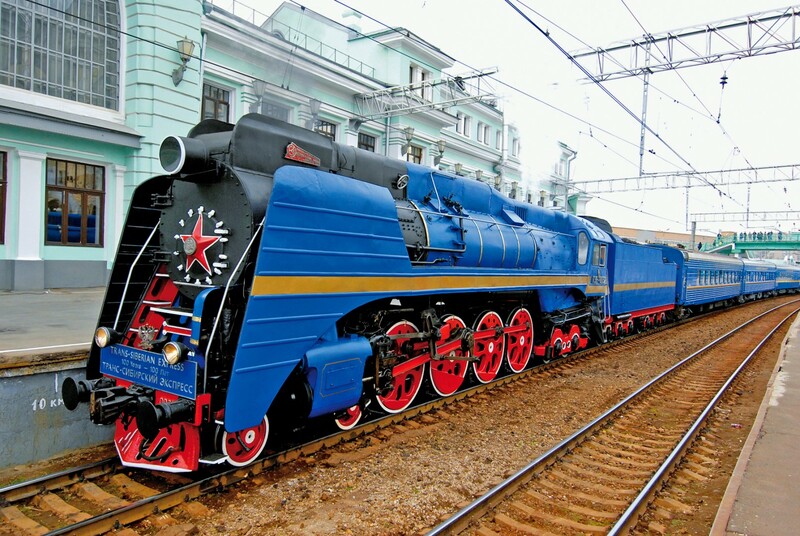 So, why not join the ‘Golden Eagle’ Trans-Siberian Express to unravel that riddle on one of the greatest railway journeys in the world. 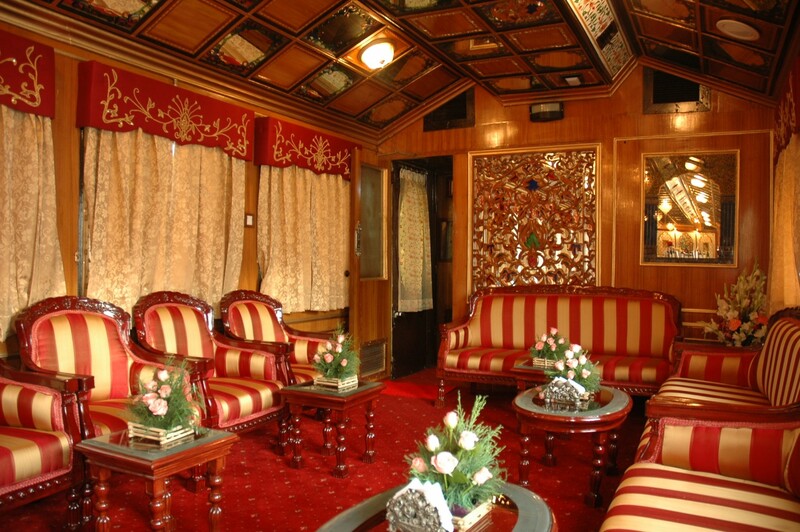 Travelling on the famed Palace on Wheels is one of the most memorable ways to explore India’s stately splendour. This remarkable heritage train, whose carriages were once owned by the erstwhile rulers of the princely states of Gujarat and Rajputana, the Viceroy of India and the Nizam of Hyderabad, has been rated one of the top ten most luxurious train journeys in the world. The Palace on Wheels started as a unique holiday concept hauled by a steam engine with its inaugural trip on 26 January 1982. The train is made up of 16 period carriages and features sumptuous lounges, two restaurant cars and double and twin-bedded cabins with en-suite facilities –all furnished in classic Rajput style. Step aboard The Palace on Wheels in Delhi and roll back the pages of time for one glorious week as you explore northwest India’s most spectacular sights in the style of the maharajas and maharanis. Take a tour of the Pink City of Jaipur, the golden citadel of Jaisalmer Fort; take a camel ride in the Sam sand dunes followed by afternoon tea. After a tour of Jodhpur’s magnificent Mehrangarh Fort continue to Ranthambore for a morning’s game viewing. From the romantic lakeside city of Udaipur continue onto Bharatpur, one of the finest bird sanctuaries in the world. Explore the deserted city of Fatehpur Sikri and the mughal capital of Agra – home to the majestic Taj Mahal and Agra Fort, before returning to the train for the overnight journey to Delhi. Small wonder, 200 years after its invention, the train continues to provide one of the most satisfying modes of travel. These great railway journeys continue to hold a certain romance; they are journeys of genuine distinction, of rare authenticity. They are triumphant proof that the golden age of travel lives on.